Boyle the tongues tender, then peel them & slit them in the middle, and lay them in the pie, like an oyster pie, with some butter, grated bread, & nuttmegg, & some salt; and when it is baked, melt & beat some butter and white wine together, and some capers which have been scalded in water, & as much sugar as you please. Then cut the lid open, and poure it all in, & then serve it up, without setting it into the oven againe. Image: Emanuel Leutze. 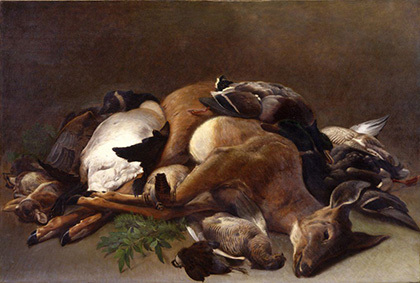 Game, 1860. Courtesy of the New-York Historical Society, The Robert L. Stuart Collection.